Urban Meyer has stepped down from his Head Coaching position at Florida. Naturally everyone turned here to SKOHRboard.com to see if my prediction of Meyer heading to Denver to fill the vacant Head Coach position there was correct. Well, as far as I can tell it's not. I've checked with all of my sources and tipsters and so far nobody has any inside info to get me. Please note that I have no tipsters or sources. 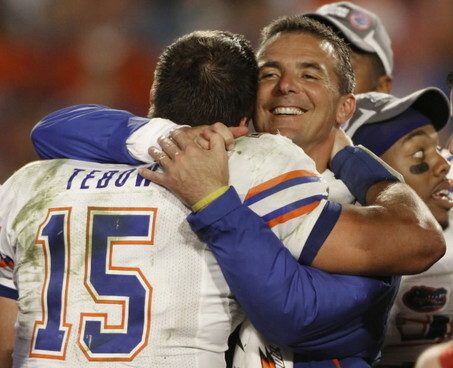 However I think it's pretty clear from that picture that Meyer would love to be back with his boy Tim Tebow. Meyer could revolutionize the professional game by bringing along the spread offense that he ran so successfully in college. With all the young talent offensive talent hanging around in Denver and the top draft selections they are assured due to the underperformance this season, it might be an attractive landing spot for him. Don't expect any developments on this story until after the season ends in a month or so. However, if I were the owner of the Broncos, Pat Bowlen, I would absolutely give Meyer a call this Winter to gauge his interest.